So you think you can type? Well, so did I, until I got an email from Fabian with his latest application, TyperLearn. While downloading I was thinking to myself, "I got this, I've been typing on these things for years." Well, wow was I wrong. TyperLearn is a rather simplistic style application with a nice straight forward user interface, but overall it is extremely helpful. After completing lessons you will be presented with your words per minute per lesson as well as your overall average speed for all completed lessons. 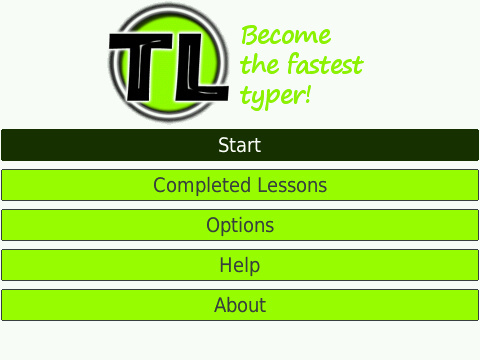 Within the application you will find lessons you have to complete, each of them geared towards learning a different part of the keyboard. You will start with the basics, learning your keyboard size, then move on to mastering the left hand, right hand and more which proves to be very helpful. If you are thinking that this application isn't useful to you and that you have already mastered your keyboard, give it a shot and see if you notice the same results after. This is a great way for BlackBerry beginners to easily learn and master the BlackBerry keyboard. TyperLearn is on sale for $4.95 until June 26th.